Another classic case of too many options at the grocery store – am I right? Hello again, friends! I hope you had a wonderful weekend enjoying the last few weeks of sunshine and warmth and lazy summer days (or not so lazy if you’re like me and working 3 jobs, volunteering, looking for placement sites, etc.) because before we know it September will be here! I’m just thrilled I finished my intense, 4-week microbiology class so now that’s done and dusted, and I’ve just gotta get my transcript over to my school. Now I have some time to draft blog posts and schedule out some ahead of time so when things get a little crazy you’ll still get a post on time. Or at least that’s my goal. We’ll see how it goes haha. 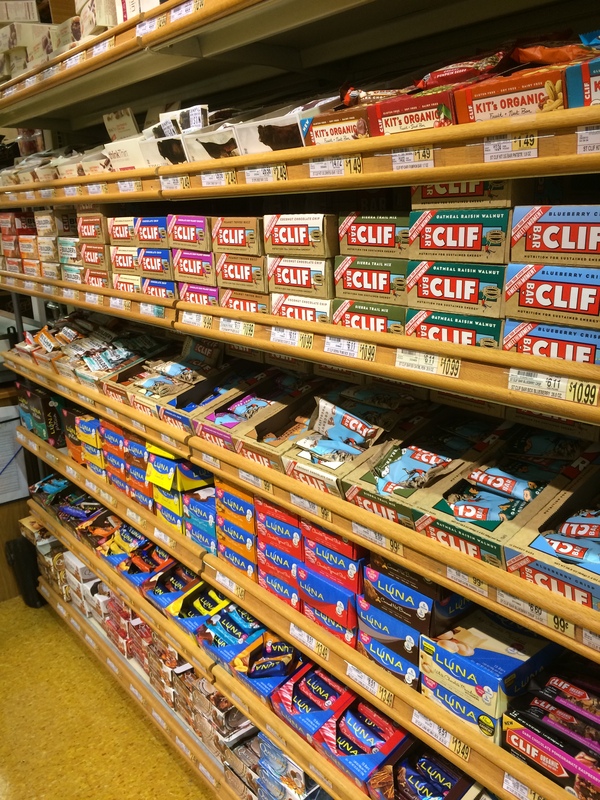 And now onto the real nitty gritty – all about them protein/granola/snack bars you see decking the health food aisles of the grocery store in the nutrition-halo glory. Granola/protein/snack bars are great options either as a meal replacement if necessary or, more likely, as a snack between meals. They’re easy to stow and quick to eat when you’re in a time crunch. BUT not all granola bars are created equal. Often times there’s this “health halo” surrounding granola bars, and if you grab any one you’re making a healthy choice. This is definitely not the case. Trust me. Holy granola bars, am I right? So when you’re perusing the health food aisle looking for a couple bars to grab and have on hand when you’re in a bind or whenever, what sorts of things should you keep in mind? Ingredients Lists – this is where you’ll find all the information you need to figure out if the bar you’ve got in your hand is worth buying! If you see sugar as on of the first ingredients on the list: put that bar down. If you see ingredients you can’t pronounce: run from it. Hello soy protein isolate, what are you? Look for bars with wholesome ingredients you recognize. Even better, pick bars that have very few ingredients altogether. So many of the snack bars on the shelves contain weird ingredients or have chemicals in them and you should run from those as fast as you can! I know a lot of the bars, especially protein bars, try to be deceptively healthy by making whatever claims they make on the packaging. This is why checking the nutrition label, especially the ingredients list, is super important. Some of the better options! I’ve decided to drum up a list of granola bars I think are worth snatching up and are useful to have when you might need them. I’ll put in a little caveat here and say that I’m focusing on what I can find in Wegmans (or one of your run-of-the-mill grocery stores). I know you can find other options at Whole Foods or other health food stores, but not everyone has access to those. Besides, I’m a grad student people – the money situation, as I’m sure many of you can relate, is a tight one! 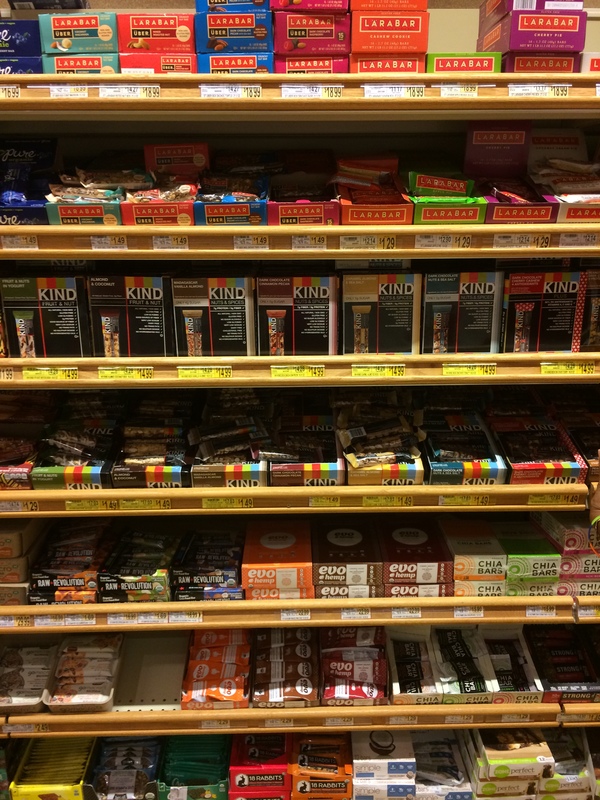 KIND Bars – many have about 5g of sugar (make sure you double check the different ones), recognizable ingredients, and a huge variety of delicious flavors. With the nuts they also pack in a little bit of protein too which’ll help keep you satisfied for longer. How can you say no?! 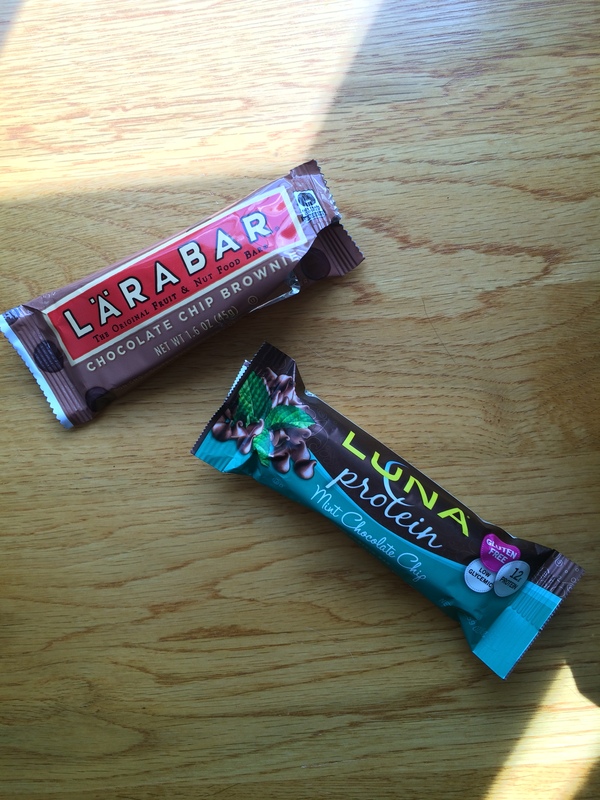 Renola Bars (from Larabar) – stick to the 8g of sugar mark and made with a bunch of tasty, real ingredients to boot! Wegmans’ Wholesum Bars – if I’m being honest, these are basically the same things as the KIND bars. Nuts, fruit, chocolate, yummy-ness. Still just as low in sugar, has recognizable ingredients that will keep you full, but they’re a tad cheaper which is always useful. Evo Hemp Bars – I have to say these are really surprising. So as I taking a little gander at the aisle, I noticed these little bars and found myself interested. Believe it or not they only have 9g of sugar AND they’re ingredients are recognizable! Basically, I try to stick to bars that have a lot of nuts and seeds in them, but I do so enjoy having a little chocolate on there. My main goal is to make sure they’ve only got around 8g of sugar and the ingredients list is full of foods I can pronounce and I already love. I hope this was a helpful guide so next time you’re at the grocery store, perusing options for some granola bars, you won’t be so overwhelmed by all the choices. Just remember: watch the sugar and keep ingredients simple!